Biological cells are the basic units of life. That is, they are the smallest units that can be alive. There are many different types of biological cells - see diagram, right. Biological cells can be classified as either prokaryotic cells (also known as prokaryotes) or eukaryotic cells (also known as eukaryotes). The words prokaryotic, prokaryotes, eukaryotic and eukaryotes are usually only introduced in moderately advanced biology courses e.g. UK A-Level (AS and A2 Biology and Human Biology). Introductory school biology courses include topics about animal cells, plant cells and differences between plant and animal cells. These are all different types of eukaryotic cells. Within both categories (i.e. plant cells and animal cells) there are many different forms of specialized biological cells. Examples of animal cells include muscle fibres, neurones and blood cells incl. erythrocytes, thrombocytes and leucocytes. Other types of eukaryotic cells include the cells of fungi e.g. mushrooms and protoctist* cells. *There are many species of protoctists - the biological "Protoctista Kingdom" consists of aquatic microorganisms that are neither plant nor animal nor fungi nor bacteria. Examples include nucleated algae, some molds, slimes and protozoa. Unlike eukaryotic cells, prokaryotic cells do not have a cell nucleus or any membrane-bound organelles such as mitochondria. Therefore neither the DNA of prokaryotic cells nor any of the sites of metabolic activity within a prokaryotic cell are enclosed by a separate membrane. Instead, everything is openly accessible within the cell e.g. ribosomes are scattered throughout the cytoplasm (not attached to the surfaces of the endoplasmic reticulum as in animal cells). 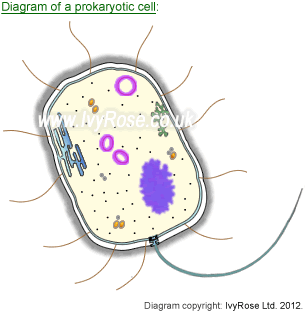 Examples of prokaryotic cells include the cells of many bacteria, e.g. vibrio cholerae, the cholera bacterium. Earliest eukaryotic cells thought to be protistans approx 1 to 1.5 billion years ago. Structurally & functionally more complex. How many cells per organism ? One or more: Unicellular organisms exist e.g. unicellular algae and yeast. All cells that are part of multicellular organisms incl. plants and animals are eukaryotic cells. Note: The numbers listed on the left are just for ease of reference to the information in this table comparing prokaryotic and eukaryotic cells. Many. All eukaryotic cells have a nucleus. The types and quantities of other membrane-bound organelles vary with the type of cell. Examples incl. endoplasmic reticulum (SER , RER), golgi apparatus, mitochondia, lysosomes, peroxisomes and microbodies & chloroplasts (in photosynthetic cells only; not in animal cells). The 'nuclear body' is the location (within the cytoplasm) at which there is a circle of double-stranded DNA - which is not enclosed within a nuclear membrane. The DNA is not associated with proteins to form chromatin. The cell nucleus is surrounded by a double membrane. Most cells have only one nucleus but some specialized cells e.g. striated muscle cells have many nuclei. (Multinucleate cells are called coenocytes.) The nucleus controls the activity of the cell and contains DNA and a nucleolus - or multiple nucleoli - in which ribosome units, ribosomal RNA and transfer RNA are produced. There are pores in the nuclear membrane. The nucleus is continuous with the endoplasmic reticulum. Short pieces of circular DNA that replicate independently of the cell genome are called plasmids. Not all prokaryotic cells contain plasmids. There are no plasmids in eukaryotic cells. The flagellum of a bacterial cell is much simpler than the flagellum of a eukaryotic cell. A prokaryotic flagellum consists of a single cylinder of protein subunits (flagellin). Prokaryotic cell flagella are rigid. Prokaryotic flagella are responsible for the motility of many bacteria and drive the cell forwards by rotating clockwise e.g. in the same way as a propeller on a ship. Flagella rotate; they do not "beat". The "motor" that drives the rotation is embedded in the plasma membrane of the prokaryotic cell. Some eukaryotic cells also have flagella but they are a different type of flagella from those found in prokaryotic cells. Some eukaryotic cells have long flexible "tails" used for movement. They are surrounded by (not protruding through, or outside of) the cell membrane and contain microtubules and motor proteins that enable complex movements. Depending on their size, these structures are either flagella (longer than the cell; few in number) or cilia (smaller but more numerous). Eukaryotic cell flagella have a 9+2 arrangement of subunits. Cell wall has a rigid framework of murein, a polysaccharide cross-linked by peptide chains. Note: The numbers listed on the left are just for ease of reference to the information in this table of comparison of prokaryotic vs eukaryotic cells. The table above does not include all of the organelles present in plant or animal cells because many of them are not present in prokaryotic cells. Some organelles not present in prokaryotic cells are listed below. Note that not all of the above organelles are present in all eukaryotic cells e.g. chloroplasts are only present in photosynthetic cells - so plant cells, but not animal cells. Plastids are only present in certain - not all - plant cells. This is not a complete list of the differences between prokaryotic and eukaryotic cells. There are unusual cases / exceptions. The tables comparing these types of cells (in general) include detail at about the level of detail expected for A-Level Biology. For more about cells see prokaryotic cell structure, animal cell structure, and an introduction to cell division.